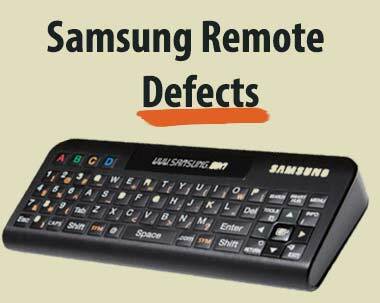 Samsung BN59-01134B Remote Control Defect | Report Now. Did your Samsung Remote stop working? Consumers who purchased a Samsung Smart TV that included the Samsung BN59-01134B remote have complained that the remote depletes the batteries very quickly, or even leaks battery acid inside the remote. Many consumers have complained that the remote no longer works. Many consumers paid over $2,000+ for a Smart Samsung TV that included a Samsung BN59-01134B remote with a QWERTY keyboard on the back. If you have had negative experiences with this Samsung BN59-01134B remote, please fill out the short form above to report your issue. We can work to help you potentially receive money to offset your negative experience with this remote and protect other consumers from this same poor experience.